This might be a little deceiving due to production level and what's going on, but it's actually really amazing. In this video, a group of kids (not sure the age group) are presented with the opportunity to try LARPing and are not turned off. None of the common stereotypes are preventing them from taking the opportunity to take some shots on their friends, and as the person who shot the video said, he was well aware that they were LARPing. This is something that's special about low level rules games like Dag, Bel, and Amt. It's so easy to learn the rules that people can be playing after a minute of explanation. And when given opportunities like this, you can get people to LARP without having to talk about hit points or making them dress up. Bravo to the group that arranged this. PS: If you know what group did this, post in the comments, as I'd like to give credit where credit's due. Would a Club LARP Work? We had a nice discussion last night at our gaming group, in which Tim gave his vision of how a LARP group should be run - as a club. Now, we're not talking about the NERO, "Is it a club or is it a business?" debate. We're talking about a full fledged club, more like Amtgard. Only more expensive/more exclusive (local rather than national). What if you had a group of about 50-60 people, and each person paid a certain amount up front to be a member of this club (for the sake of things, let's say $100 dollars). You would then know exactly how much you have to spend and could have the group vote on where to spend it, aside from events. It is a LARP, after all. There would be no profit - only a game treasury which could be spent on events for its members. Clearly, it would be a labor of love, but ideally it wouldn't fall too much on one person's shoulders. On the other hand, events themselves would be free (or at least very inexpensive), as opposed to the pay as you go method of most LARPs running today. So, if you were given the opportunity to participate in a club like this, and most events were included in your dues fee at the beginning of the year, and you had a partial say in where the money goes, would you join? For those of you with an eye for detail, you might have already noticed there were two additions to the blogroll this week. I'm excited about both of them. This is a blog that talks about general tips and information regarding LARPing. It's been around since July, with a new post every Thursday. Some great information can be found there, so I highly suggest giving it a read. This one is more of a general gaming blog with heavier focus on Video and board gaming. But still, some great stuff there, and the site updates regularly. I know I've gone about this in detail in the past, but I'll say it again. If you know of some blog/forum/content site that you believe is a treasure trove for gamers/LARPers, send it to us at larp.ohio@gmail.com, and we'll get it up on the blogroll. I was super excited yesterday, when I noticed one of the new movies available on Netflix Instant was The Wild Hunt. 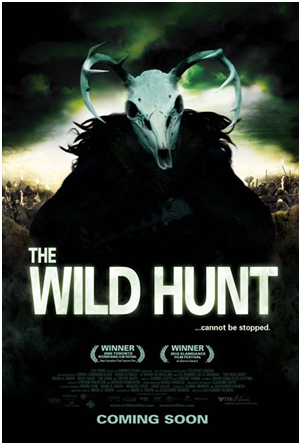 For those of you not in the know, The Wild Hunt was an Indie film that was considered to be the closest thing to Mazes and Monsters for LARP. You know, everything's fun and games at a LARP event until someone takes it too seriously. To start off, I was really impressed at the quality of the movie. At the beginning I was a little worried, as some of Lyn's lines were hard to hear, but soon after I felt like I was watching a movie from a major studio. The movie's portrayal of LARP is amazing. Sure, some of the characters are a little tongue-in-cheek when representing stereotypical LARP archetypes (like the male plot member dressed like a faerie), but ultimately they do a good job of integrating IG elements of a LARP with OOG interactions, making it seem like the characters weren't one-sided or obsessed with the game. Without giving spoilers, the movie takes a dark turn at the end, and is actually pretty brutal. However, I think this was done very well, without it seeming like the LARP itself caused brutality, like the aformentioned Mazes and Monsters. But I certainly wouldn't show that part to kids or people who want to know what LARP is. All and all, it's worth giving a watch. I'd probably note it as slightly more realistic in it's portrayal of LARP than Role Models, but I think I'll still stick to Role Models when showing someone who's never LARPed what LARP is. I think Fall is the best season for LARP, but that might just be me. WAR will be hosting a 2-day event this weekend starting on Friday, September 30th and ending Sunday, October 2nd. The game will be held at Lewis Arboretum at the IG location of Rockcrusher Forge. It's $50 to PC ($30 with a good NPC ratio) and is free to NPC. This game wll be using 9th edition rules. NERO Indiana will be hosting a 2-day event this weekend starting on Friday, September 30th and ending Sunday, October 2nd. The camp for the game is TBD. It's $50 to PC ($40 with pre-registration) and is free to NPC. This game wll be using 9th edition rules. Metro NERO will be hosting a 2-day event this weekend starting on Friday, September 30th and ending Sunday, October 2nd. The game will be held at Camp Kiwanis (MI). This event will have two IG locations. It's $30 to PC (with pre-registration). Can someone confirm the cost to PC at the door, the cost to NPC, and the rules that will be in use at the event? It's hard to find decent LARP videos these days. I sometimes feel like I've gone through all the good ones. There's a number of parodies that make fun of LARP, but in all honestly, the quality isn't really that good. However, I did find this video of a guy fighting on jumping stilts. I always thought it would be neat to incorporate a pair of jumping stilts as a tool to use in certain situations, but the fact of the matter is that none of the games I play in use a flat field, and using those at the camps would be asking to get hurt. Still, I would love to fight something like this. I thought this would be an interesting topic to talk about, as it's something that's near and dear to many NERO players. For those of you unfamiliar with the NERO world, the game system has been around for over 20 years now, with some characters being almost that old. Unfortunately, the game was never designed to handle characters over level 30 well, and with 20 years of gameplay, NERO has many characters who breach that mark, with some going as high as level 50+. Add that to the fact that there is a pretty significant gap in effectiveness between low and high level players, and you've got a serious problem. See, NERO has no "Exit Strategy." There comes a point in every game where it makes sense to start getting high level characters out of there. Some games do this by trying to make it more deadly so that those high level characters permanently die, but this is a very weak strategy. On the other hand, some games offer some kind of compensation for players to retire their characters, or have a set timeline before a full reset, thus providing more effective exit strategies. The Dreaming even had a system of experience decay that made it so that you eventually could only maintain the abilities you already bought (unless you wanted to learn something else and let your skills lapse). So if you're designing a new LARP that has advancement built into it, please think about an exit strategy for characters. Otherwise, when you're game's being run 20 years down the road (good for you! ), you'll run into issues like NERO. So this post is not specific to LARPers, but is totally worth talking about anyways. A while back, I talked about a few youtube videos that I got from TED (via Ruthless Diastema) about how we can break the stigma if we use games the right way. Turns out, one company did just that. Foldit is a company that takes real world algorithmic puzzles and turns them into a competitive online gaming environment. I know it sounds like it wouldn't ever be worth anything, but preliminary reports show that they have helped make major steps in the war on HIV. If you have a lot of empirical work to do, make it seem fun and get people who spend hours on gaming do the work for you. Games build pattern recognition in gamers, which is something that's still somewhat hard to do with computer programming. As a note, this is exactly what Jane McGonigal talked about at TED. PS: Here is the full document in regards to steps made in protein structure predictions. Whole lot of LARP available in the Ohio area this weekend! NCN will be hosting a 2-day event this weekend starting on Friday, September 23rd and ending Sunday, September 25th. The game will be held at Camp NEOSA at the IG location of Syrinx. It's $45 to PC and is $2 to NPC (to cover insurance). This game wll be using 9th edition rules. OGRE will be hosting a 2-day event this weekend starting on Friday, September 23rd and ending Sunday, September 25th. The game will be held at Camp Myeerah at the IG location of Oasis. It's $40 to PC and is $10 to NPC. This game wll be using 9th edition rules. NERO SWV will be hosting a 2-day event this weekend starting on Friday, September 23rd and ending Sunday, September 25th. The game will be held at Camp Cherokee (KY) at the IG location of the Borderlands. It's $50 to PC ($40 with prepay) and is free to NPC. This game wll be using 9th edition rules. Bloodlines will be hosting a 2-day event this weekend starting on Saturday, September 24th and ending Sunday, September 25th. The game will be held at Camp Burnamwood. It's $30 to PC ($5 for cabin, $5 for feast) and is $5 to NPC (or free if you forgo GP). Vandlar will be hosting a 2-day event this weekend starting on Friday, September 23th and ending Sunday, September 25th. The game will be held at Lewis Arboretum. It's $55 to PC ($40 if you pre-registered) and is free to NPC, but all players must pay an additional $10 for food. I have written in the past about various ways to represent things that can't be done easily in real life, like picking a lock. In games where you need a skill to pick the lock, it might be better to use something that doesn't require the OOG skill to do it. However, there are some circumstances where we tend to go to far when trying to find an alternate way to represent something, especially in modern or near modern games. And I think it's important to take a step back and ask yourself why you don't rep it in a realistic way. In the Knutepunkt 2011 "DO" book, there's a description of a game called Babylon. The write up on this game is amazing. If you wanted to be a techno guy, they actually taught you how to do that before the game started. So when you had to solder something in the field while being shot at, you knew exactly how to do it. And to rep soldering... you soldered a wire. Pretty novel, right? I think we could use a bit more of this in the games we run. If you want someone to fix an electronic puzzle, put something simple together and have them mess with wires or solder something. The same could hold true for a number of other tests being made at games. What are some of the most memorable tests you've had to perform? How realistic were they? This is a continuation of my post on Battlefield Mathematics. There's only so much the player can do to try and ease the issues associated with the speed of battle. However, if you're keeping this in mind when designing your LARP game, you can take further steps to reduce complexity. I know everyone wants to swing big numbers. However, swinging much lower numbers makes the math of combat a lot easier to follow. For the most part, Accelerant type games follow this theory. Instead of giving a person 50 body and letting people swing 10s, they have 5 body and people swings 1. It really can make the math a lot easier. One of the common ideas take from various roleplaying games is the idea of weaknesses to a type of damage, which usually ends up causing double or triple damage. Let me tell you what isn't easy for some people - multiplying numbers when taking damage. Instead, add a flat damage increase or simply not allow defenses to be used against opposing elements. Every time a player is hit with something, they have to review their current state. If I've been hit by a magic spell, I need to identify if there's any defenses I have for that effect before I can continue with the fight. By reducing the number of possible defenses, you make the state check faster. It takes a fair amount of brains to be able to compete in most LARP combat. And I'm not referring to developing strategy of sorts. I'm referring to the ability for a combatant to comprehend everything they've been hit with to determine their current state. In the heat of battle, it can be hard to tell if you should still be up or if you still had defenses for that spell you were just hit with. The following is a list of things that players should keep in mind in order to ease battlefield math as much as possible. Sometimes it can be hard to keep track of how many hit points you have left. A lot of player will take their starting body and subtract hit points as they are damaged. Truth is, subtraction is a lot more difficult than addition, especially when you're not dealing with round numbers. So instead, count the damage you've taken with addition, and whenever you exceed your maximum hit points, then you know you're down. We used to have protective rings, but let's be honest, those are hard to update or reference in a fight. Instead, use bracelets, rings, or any other simple identifier that can be seen on your hands to remind you what protective you might have. You can have your left hand represent inactive spells and have your right hand be active spells. If your blue bracelet is on your right hand, it means you still have a shield magic up. If your red bracelet is on your left hand, it means you do not have a magic armor up. Obviously this doesn't need to be updated in the heat of combat. It's intended for remembering what you have between lulls instead of assuming you have all protectives. A lot of the excessive damage taken by players is due to the fact that they are trying to keep track of how much damage they're putting out. Both PCs and NPCs do that. When you and your opponent both track the hits they're dealing instead of the hits they're receiving, one of you two is definitely going to take too much damage. Trust that the other person is going to monitor the damage that they're taking. Next post will be about the ways that game designers can make it easier for the players to perform Battlefield Mathematics. It's fall, one of the best times to LARP. NERO Cincinnati will be hosting a 2-day event this weekend starting on Friday, September 16th and ending Sunday, September 18th. The game will be held at Camp Graham at the IG location of Ironpost. It's $50 to PC ($45 with prepay) and is free to NPC. This game wll be using 9th edition rules. Einherjar will be hosting their September battle this weekend on Sunday, September 18th at Plum Creek, South Side in Medina. Weapon Check starts at Noon and fighting starts at 1:00 PM. It's $3 and minimum garb rules apply. Exiles will be hosting a 2-day event this weekend starting on Friday, September 16th and ending Sunday, September 18th. The game will be held at the Sycamore State Park group camping location at the IG location of Silver Springs. It's $40 to PC and is free to NPC. Today's vid is a video from one of the artists that was at the concert on Wednesday. Random AKA MegaRan is an ex-Middle School teacher gone nerdrapper. He raps about video games because those are what kept him out of trouble as a kid. If you consider yourself a fan of either Mega Man or of hip-hop, you should give this video a try. I know this isn't particularly LARP related, but I think it's worth mentioning. I had a chance to go see the mc chris show at the Grog Shop in Cleveland last night, and it was amazing. Four different rappers, all singing about different things. But what united them was that they all recognized that they were nerds, whether they were rapping about comics, video games, or Shakespeare. And you know what? They were actually really good. The world is finally coming to terms with the fact that pretty much everyone has something they're nerdy about. Now all we need is a Nerdcore rapper that raps about LARP. The Week In LARP Change! Just a notice for everyone - I had posted the incorrect camp site for the WAR campaign event on the Week in LARP post. The game will be held at Camp Giscowheco, not Lewis Arboretum. Thanks for the heads up, Sarah. I know it's been said before, but I'll say it again. Europeans are leaps and bounds more advanced than we are at LARPs. For one, they have an academic conference every year (since 1997) called "Knutepunkt." I just recently discovered this, and I'm honestly suprised I haven't found it sooner. They've got all kinds of great information about the theories behind LARPing as well as techniques for running games and opinions on the LARP scene in general. And it's all free for download here. If you consider yourself an academic when it comes to LARPs, I highly recommend giving it a try. Edit: The camp for the WAR event is Camp Giscowheco, not Lewis Arboretum. I totally forgot that Labor Day was a Monday, so this post is a little late. WAR will be hosting their campaign event starting Friday, September 9th and ending Sunday, September 11th. The game will be held at Camp Giscowheco at the IG location of Ironholm. It's $50 to PC ($30 with a good NPC ratio) and is free to NPC. This game wll be using 9th edition rules. Guess what? MOAR PROP STUFF! This is a big roundabout adventure around me working that Sintra armor. I've been messing with it, and it really is a nice medium. However, I was wondering if there was a way for me to make it into a robotic mask, but I realized I would probably need to get a mold of my face. Which led me to this little gem. This actually looks a lot easier than I once thought (not in a "your job is easy" way but in the way that I never thought it would be accessable). It's also not nearly as expensive as I once thought. The only thing stopping me at this point is that I have to wait for Christmas (to get gifts), and the fact that I'm not as artistic as I could be. But either way, check out this 5 step instruction video on how to make masks. As of yesterday, here were LARP Ohio's standings in Google (searched by me while logged out). I am quite astonished by our standing in "Ohio blog", since it has no references to LARP whatsoever. Maybe this will help it become mainstream? Anyways, I wanted to give my heartfelt thanks to all the readers for making this happen. That's all on you.